Hey there! Last week, I mentioned I would probably talk about Magic 2014 Core Set Limited some more, but as I haven’t yet had time to play any, it will have to wait another week. This week, I will instead be taking a look at some brews featuring new cards from M14. I will be presenting two different decks along with their lists and then discussing the strengths and weaknesses of each deck and how they could be modified going forward. There have been a lot of various Young Pyromancer decks floating about the Internet lately, so I thought I’d chime in on the subject, too. I recently received this list from my friend Aleksi Vaeaenaenen, and it prominently features the new red 2-drop Young Pyromancer and is looking to get some very good value out of it. "U/R Delver by Aleksi Vaeaenaenen"
This deck features a lot of cheap spells so that you can get the most out of your Young Pyromancer. The creature base features Snapcaster Mage, another friend of cheap spells, and Delver of Secrets, a card we haven’t seen a whole lot of in a while. Perhaps the strangest inclusion is Chandra's Phoenix, but with the deck having Thought Scour and plenty of burn, generating value from these should not be very difficult. I like the fact that you can just charge in with the Phoenix against an opponent representing Restoration Angel, and even if the opponent has it, you can probably just finish it off with some burn and bring the Chandra's Phoenix back later. I think the biggest problem with this deck is that all the creatures apart from Chandra's Phoenix are very fragile, and a Bonfire of the Damned is almost always bad news for you. Olivia Voldaren is also a major problem even though you do have a fair amount of removal for her. Other than that, one problem that decks like these sometimes face is drawing your cards in the wrong order. As you want to be aggressive, you would prefer to curve Delver of Secrets into Young Pyromancer, but this is not always the case. If you spend too much time in the early game durdling with your cantrips, you can very easily fall behind in tempo, and as the game goes longer, your aggressive cards do less. This problem can somewhat be avoided by knowing when you need to mulligan an otherwise fine hand because it just doesn’t have enough aggression. I do think this idea has some great potential, and it would probably need a bit of tuning to make it there. Some potential cards I think could be played in this deck are Unsummon, Dynacharge, Runechanter's Pike, Thundermaw Hellkite, and Chandra, Pyromaster. I think a couple of Unsummons would be great as a way to clear the way for your attackers, and they’d also be decent against Restoration Angel when you are attacking with your Insectile Aberration. 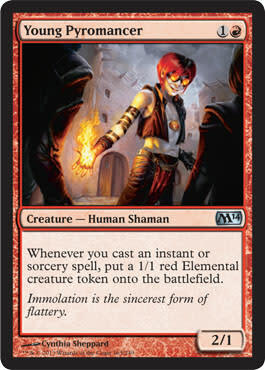 Dynacharge or something similar would be great as a one- or two-of since I think you would really like to get more out of the tokens you make from Young Pyromancer. Just making 1/1 creatures is fine and all, but having something to really supercharge them would be very valuable. It’s worth noting that Snapcaster Mage and Dynacharge don’t work very well together, as you can’t use overload from the graveyard. Runechanter's Pike is another way to gain more use from your smaller creatures, and it’s a way that works well with the large number of instants and sorceries in the deck. Thundermaw Hellkite might seem a bit odd, but it could work as a curve-topper for this kind of deck, as you can still fairly easily make it to 5 mana with all the cantrips. Finally, the new Chandra, Pyromaster could well find a home in this type of deck, as it helps you be aggressive by clearing away blockers and letting you refuel if you don’t have much going on at the moment. As far as sideboard cards go, Augur of Bolas could be sweet against other aggro decks, as it blocks well and will hit most of the time. Bonfire of the Damned numbers three and four are probably worth playing, as there seem to be a lot of new decks popping up relying on a large number of small creatures. 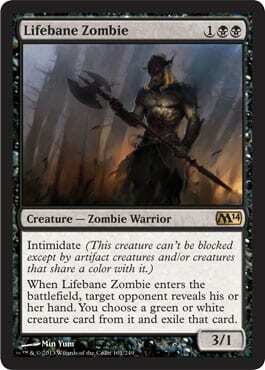 Examples include the W/B Humans deck and the various ramp decks featuring twelve mana creatures. I think Negate, Dispel, or some other counters are also worth playing in the sideboard, as you want to sideboard out a fair number of the smaller burn spells and Bonfire against control. Mizzium Mortars might be needed if decks with Loxodon Smiter start making a return and you need to get rid of the beefier creatures. Ever since Lifebane Zombie was spoiled, I have been thinking of ways to get the most out of it. The card is very good on its own, as the body is good enough that the ability does not always have to hit for it to be playable. To really get the most out of it, I thought about building a deck that benefits from the fact that it is a Zombie and that is being able to take advantage of the ability. Perhaps among the toughest things about this is the mana base since you would like to play Geralf's Messenger reliably on turn three but still have access to white mana when you need it. I’m not a fan of Guildgates, but I think here, you probably have to play at least two or three to make the mana work. As it is now, you have twelve sources of white mana and an additional four Cavern of Souls for the white creatures. As far as the removal spells go, Victim of Night is almost always better than Doom Blade, but I would like to try out the one Doom Blade, as it can be slightly easier on the mana when you draw Cavern of Souls. Doom Blade also kills Huntmaster of the Fells, which is a nice bonus. I played a similar deck for a while during the spring, and Obzedat, Ghost Council from Cavern of Souls was always a huge beating against any control deck, and I also like Obzedat in most other matchups as well. You have enough blockers that you can afford to blink him out even against the aggressive decks, something you can’t always afford to do. The Zombie deck has typically had problems with aggressive decks, so I am trying out a few Gnawing Zombies as an early blocker and a potential source of life later on. The interaction between Gnawing Zombie and Gravecrawler is especially good, as you can just drain the opponent for 3 mana as often as you want. I do think Gnawing Zombie is much better in this kind of deck than is Blood Artist, a card that saw play in W/B Zombies earlier on. I think this deck has potential, as the sixteen Zombies in the core are all very good. Lifebane Zombie should help a lot against both Thragtusk and Restoration Angel that could cause you some serious headaches earlier. 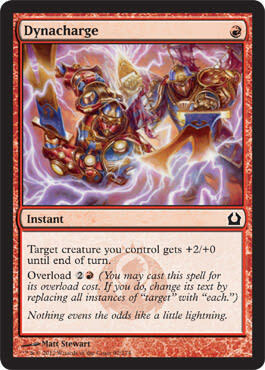 Your best draws are very aggressive and also very resilient to sweepers—apart from Terminus. This is good, as both Bonfire of the Damned and Supreme Verdict seem to be growing more popular, and Terminus becoming a little less popular. Pillar of Flame is mildly annoying, but it is still only a one for one. In the sideboard, you have access to some very good cards against control, such as Duress, Sin Collector, and Appetite for Brains. Sin Collector is the best here since you already have the Restoration Angels in the main to blink it. Against aggro, you can run some additional removal spells and maybe even some more Gnawing Zombies. You could also try a few Archangel of Thunes to help in the aggro matchups, although they might be a bit rough on the mana base and a bit slow. I’d also suggest one or two Curse of Death's Hold against Junk Aristocrats, as actually pushing through with your creatures can be problematic in that matchup. I was also thinking about Shadowborn Demon as a potential inclusion against midrange decks, as it handily survives combat with Thundermaw Hellkite and can take out the opponent’s biggest creature when it comes into play. You even gain added value when you blink it with Restoration Angel, and you should have plenty of fodder to sacrifice to it. I hope these two brews offered you something new to think about for Standard. If you decide to try either of these out or make some modifications to them, be sure to let me know, as I’m really interested in hearing how these play out! I’ll be playing a whole lot of Magic this coming weekend, as it is time for Finland’s largest convention Ropecon. Unlike the name suggests, the event doesn’t actually have anything to do with rope, but instead, it’s a general roleplaying and gaming convention. This year, I will be playing a DGR Team Sealed with Sami Haeggkvist, who is also on the Finnish WMC squad, as it’s very good practice for the big event in just one week. I’ll also be playing a large M14 Sealed tournament as part of the Poro Tour, the closest thing we have to an Open or 5K. 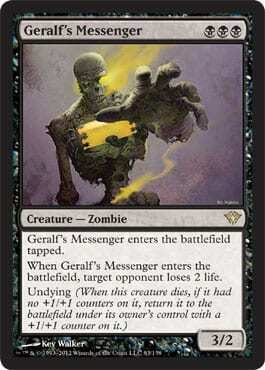 This means I hope to have some more insight into the M14 Limited format that I can then share with you all next week. As usual, if you have any questions, comments, ideas, or suggestions, be sure to let me know either directly via Twitter or through the comments section below.